There’s no comparison: butter beats shortening for pie dough. This all butter really flakey pie dough is THE BEST recipe out there and you won’t believe how easy it is to make! I’m 35 years old and I’m intimidated by making pie. 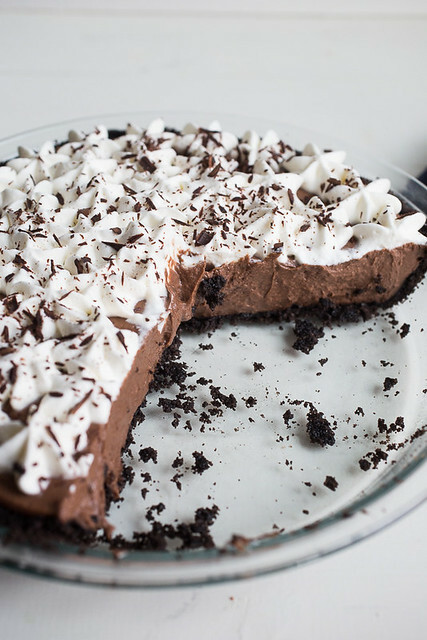 Now that we’ve got that out of the way, you’ll understand why there is such a paucity of pie recipes on this site. Oh sure, there was this strawberry rhubarb pie a few years ago and this sour cream apple pie as well. There were also a few things I’ve made with homemade pie dough: galettes, hand pies, empanandas, and tarts. But pies themselves? I don’t know. I feel like it’s a two-fer that can go wrong – both the filling and the dough need to be great, right? So that’s where this all butter really flakey pie dough recipe comes in. After all of the dough I’ve made in the past, this one was, by far, the absolute best. It’s an all butter dough made with cold water – no vodka here! And now that I’ve seen the super flakey results of this dough, you’ll never be able to convince me that shortening in pie dough is better. This dough yields such a flakey crust that my mom thought I used puff pastry to make the apple slab pie I made for my parents over the weekend. And she’s been around the dessert block once or twice. 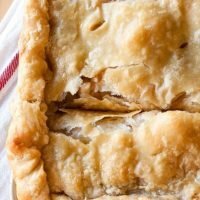 Pie crust that looks like puff pastry? Put your hands together, friends. The reason for this is the big, fat chunks of butter suspended throughout the dough, a result that can only happen from making pie dough by hand. 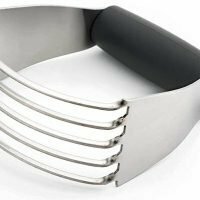 Use your fingers, two knives, a pastry cutter – whatever! 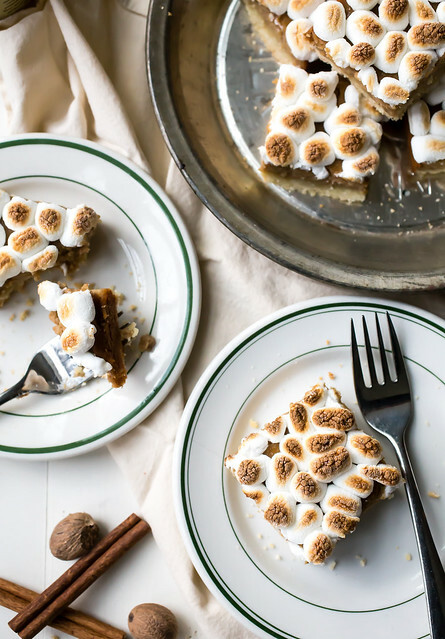 Just skip the food processor or stand mixer, as tempting as they may be. Not only do I find it amazingly gratifying to make such a simple and timeless kitchen staple like a pie dough recipe by hand, but I have complete control over how big I leave the chunks of butter; whereas machines often over process the butter. And bigger chunks of butter = really flakey pie dough. 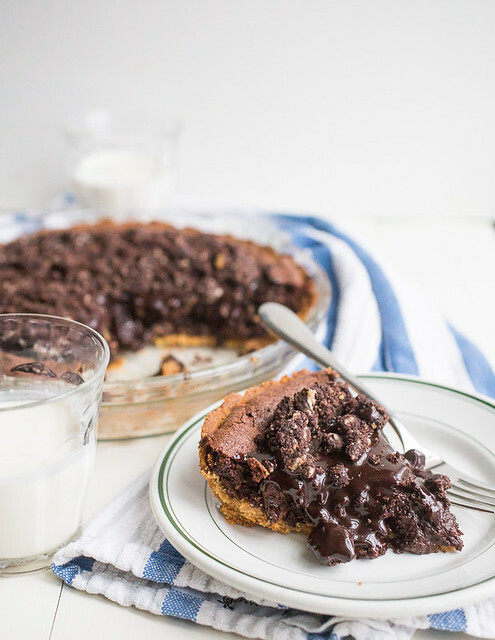 This is why pie dough without shortening will always be the king of pie doughs. 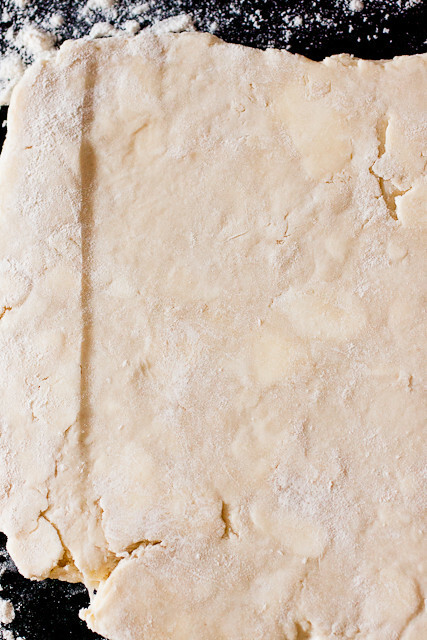 How to Make Really Flakey Pie Dough. Really! The only other thing to consider, which you would already know if you’ve ever made any kind of pie dough, is that you need to keep the dough extra cold before you bake it. If that means that you stick your unbaked pie or tart in the freezer for a few minutes before baking it to chill a warmed dough that you’ve just rolled the heck out of in order to firm up the butter again, then do it. When the oven heat hits the cold butter, water in the butter evaporates, creating pockets in the dough and that gives you your flakey crust. 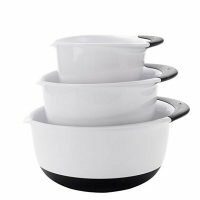 And you want the butter in the dough to be COLD so that it holds up well to the heat and doesn’t slump in the oven (or slide off the edge of the pie plate and onto your oven floor – trust me on this one!). So go on! 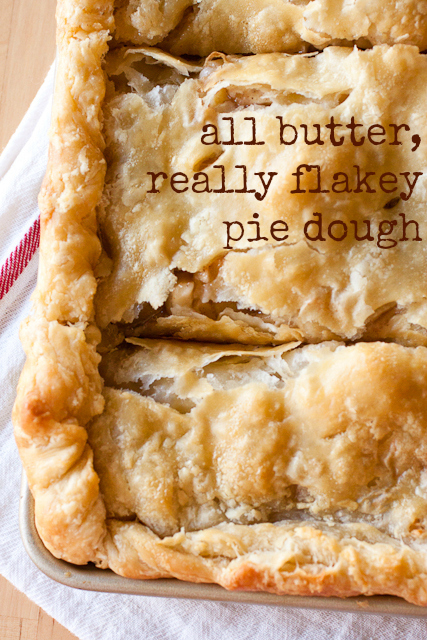 Make a few batches of this all butter really flakey pie dough recipe for your upcoming holiday celebrations! Even if you make the dough early and freeze the dough for your Thanksgiving and Christmas pies, you’ll be ahead of the game. Which means you’ll have more time to bake cookies. And nobody ever complained about having more time to make cookies, have they? Measure the flour into a large, wide bowl. Whisk in the sugar and salt. Toss in the butter cubes and coat them all with the flour. Using your first 3 fingers of both hands, mash up the butter into smaller pieces, just bigger than the size of peas. 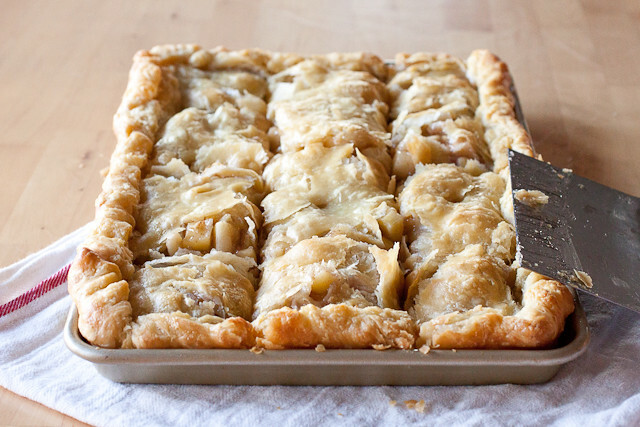 You can also do this with two knives or a strong pastry blender. I prefer using my fingers. Once the mixture looks sort of uniform, slightly crumbly, and the butter is broken up, stir in a ½ cup of water with a rubber spatula until the water is absorbed and the dough starts to come together. If the dough is still dry and crumbly, add the remaining ¼ cup of water. 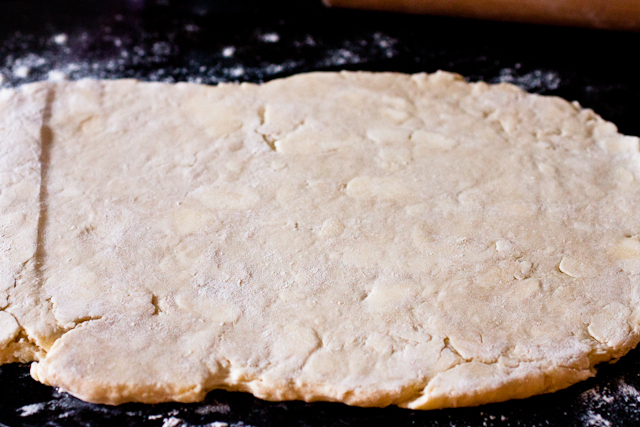 Bring the dough together with your hands until it forms a soft and almost loose ball. Divide the pie dough in half and transfer one half to a sheet of plastic wrap and mold it into disk, about 1-inch thick. Use the plastic wrap to help bring the dough together, if needed. Repeat with the remaining dough. Chill the dough disks in the refrigerator for at least 2 hours before using. You can keep this dough in the fridge for up to a week or up to 2 months in the freezer before using. 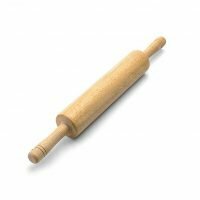 Roll the dough directly from the refrigerator (do not allow it to come to room temperature – remember you need to keep the butter really cold) or if frozen, allow the dough to rest in the fridge for one day before rolling. 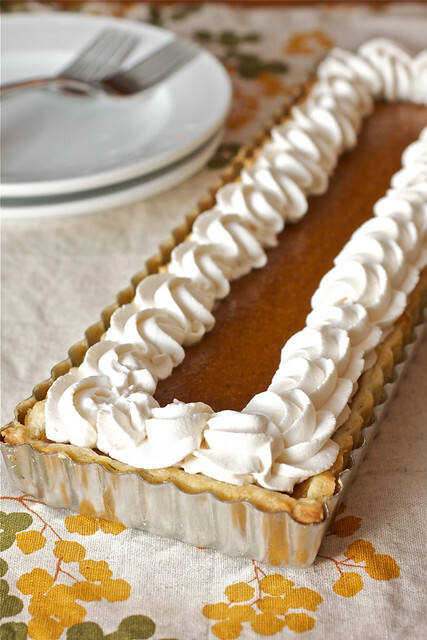 Proceed with the instructions for your pie recipe, including the recommended baking temperature and time for that recipe. 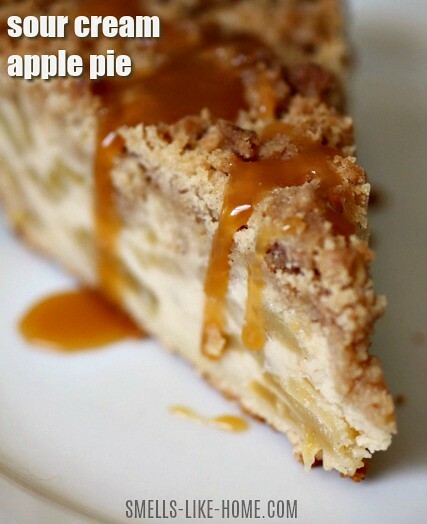 If you want to make the apple slab pie recipe shown in the photos above, you can find the full recipe HERE. That recipe includes details for adjusting this pie dough recipe to fit the jelly roll pan you'll use to make a slab pie. The pie dough recipe shown above will only yield 2 9-inch pie crusts and you need more than this for a slab pie. Visible butter chunks in your pie dough from cutting the butter into the flour with your fingers. Food processors mulch the butter up to pieces that are too small to create lots of flaky layers. Keep these keys in mind as you make this pie dough and you can’t go wrong!